The Filipino superstar arrived a full week ahead of his rematch with Tim Bradley Jr. this Saturday and has already participated in early Fight Week activities. On Tuesday afternoon, he once again laid steps at a very familiar place - The MGM Grand Hotel and Casino in the famous Las Vegas Strip – site of two of the lowliest times of his renowned career. The first of which happened 22 months ago when he first met Bradley Jr. in a welterweight battle. Pacquiao left the MGM Grand Garden Arena on June 9 of 2012 empty-handed, beltless, baffled and confused after two judges at ringside awarded the victory to Bradley Jr. despite what the majority thought was a clear victory for him. That controversial loss against Bradley broke Pacquiao’s 15 fight and 7 year winning streak that dated back to 2005. It was also the first time in his career that he failed to defend his title against a challenger. It was a sad time for Pacquiao, his legion of fans and in the sport of boxing. It resulted in dismay and distrust at the system of judging at ringside. It raised conspiracy theories that the sport is run by people from the underworld, like talks of the Mafia and the mob exerting influence in the sport in the 50’s. It was a dark cloud that loomed at a sport that is trying to be relevant in the States. Boxing gets full attention when a superstar of the sport fights. 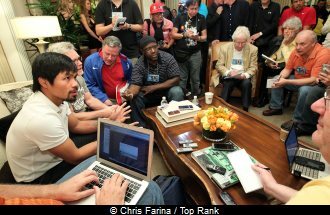 National and International media cover such events and its pre, during and post-fight activities are well chronicled in the media. The great boxing robbery in Vegas on June 9, 2012 was in full view of the world because of this. This week, Pacquiao, Bradley Jr. and the sport of boxing will revisit that controversial fight. Everything around them during Fight Week will remind them of that first time they met each other. They will also try to rectify the result of that first meeting. The two fighters have something to prove to the other competitor, to the fans and to the sport. Bradley and Pacquiao believed they won their first meeting and if this rematch is without the controversy of the first – then maybe, we can all forget what transpired twenty-two months ago at The MGM Grand Garden Arena. They say all perpetrators return to the scene of the crime. Fortunately, the two judges at ringside, namely Duane Ford and C.J. Ross, who were blamed for the first Pacquiao-Bradley debacle won’t be. But the victims like Pacquiao, even Bradley Jr., us fans and observers of the sport and all of boxing will. This time around, everyone is hoping for a fair and legitimate ending. Photo: Pacquiao (L) talks to the media after his grand entrance at the MGM Grand Hotel & Casino in Las Vegas Tuesday. Photo by Chris Farina / Top Rank.